A child or consumer's finger can become caught in the opening formed when locking and unlocking the hinge mechanism which is used to adjust the handlebars on the strollers. This presents an amputation and laceration hazard to children and the adults handling the stroller. Kolcraft and CPSC have received five reports of injuries involving the hinge mechanism, including reports of three children whose fingertips were amputated and two adults whose fingers were either smashed or lacerated. This recall involves about 36,000 Kolcraft Contours Options three- and four-wheeled strollers in the US and 270 in Canada. Strollers included in the recall have model numbers starting with ZL002, ZL005, ZL008, ZL015, and ZL018. On the ZL002 model, the model number and date of manufacture is printed on a sticker above the left wheel. 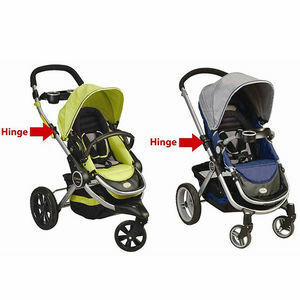 On the ZL005, ZL008, ZL015, and ZL018 models, the model number and date of manufacture is printed on a label sewn into the edge of back of the stroller seat pad. The strollers were manufactured from January 2006 through November 2009 and sold in various color schemes. Juvenile product specialty stores nationwide and online at Amazon.com, Target.com, and ToysRUs.com from January 2006 and June 2012 for between $150 and $160. Immediately stop using the product and contact the company to receive a free repair kit. For additional information, please contact Kolcraft at (800) 453-7673 between 8 a.m. and 6:45 p.m. ET Monday through Thursday, 8 a.m. and 3:30 p.m. ET Friday, or visit the firm's website at www.kolcraft.com.